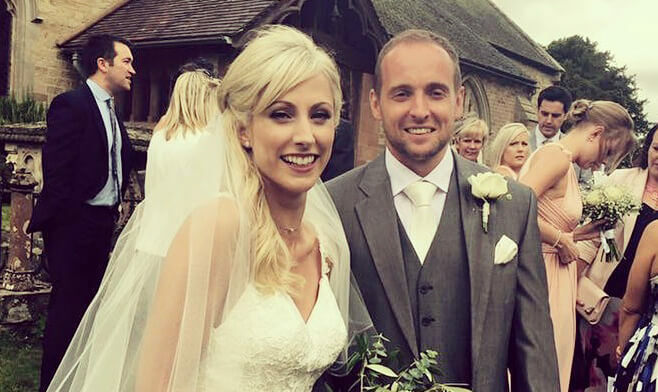 a tailored wedding DJ that specialises in you..
MisterFox is an award winning DJ who plays in the Telford, Shropshire area. 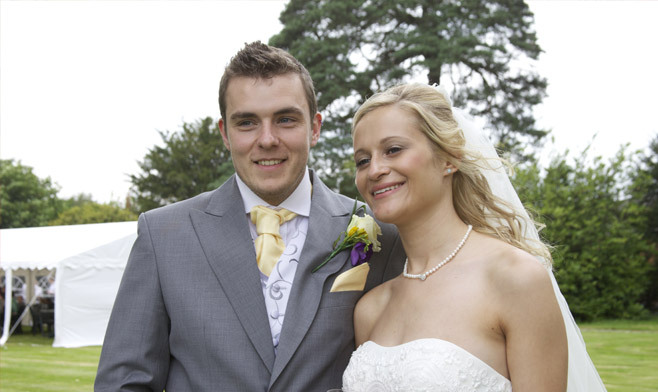 Who specialises in Weddings, no venue is too small or too big. Your music is very important to MisterFox, thats why a music consultation and personalised playlist comes as standard to any MisterFox event. Requests on the night are actively encouraged making sure your guest feel part of the celebration. 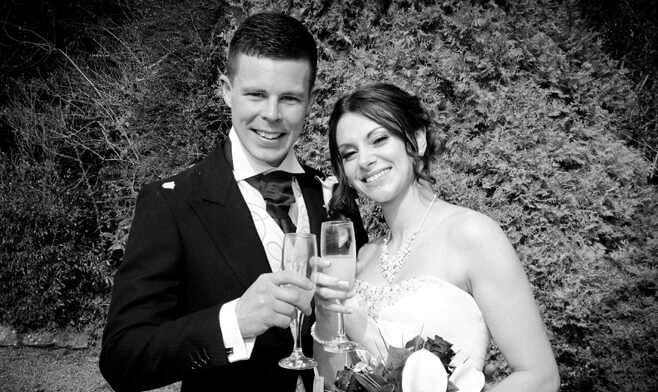 MisterFox was awarded 'Best Wedding DJ 2016' in the West Midlands at The Wedding Industry Awards. Voted for by couples and judged by an independent panel. Your playlist is not limited to just; first dance, last dance and a few in between. Your playlist is unlimited! The music at your event is limited only by your imagination. With every MisterFox event a music consultation and a personalised playlist comes as standard i.e. FREE! This guarantees that you get the music that you want! To get a quote, find out more about MisterFox or to make a song request then please fill in the form below. To help with request please say who / when the request is for and as much detail about the song as possible. We were so grateful to Brian for stepping in for our initial wedding DJ, who was unable to play at our wedding due to unforeseen circumstances. Brian instantly made us feel at ease, and spent time with us going over the plans for the day. He was so organised and helpful during the day of the wedding, making sure the day ran smoothly. He kept our guests dancing all evening, playing requests and keeping the party going. 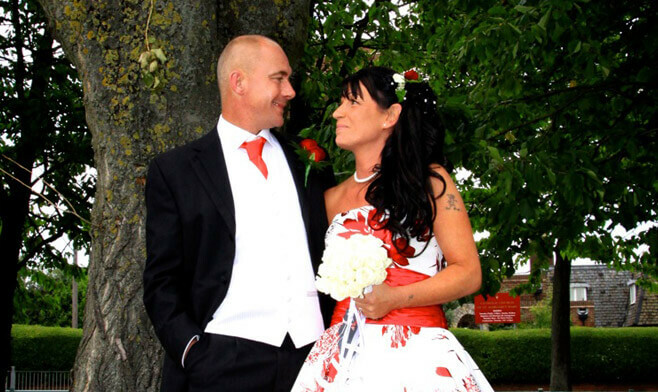 We would definitely recommend Brian for anyone planning a wedding or any other event. Thanks again for everything, all the best for the future. From our first contact with Brian, we knew that he was the DJ for us. He put us at ease straight away and he guided us through the whole process of planning with no question too silly to answer. 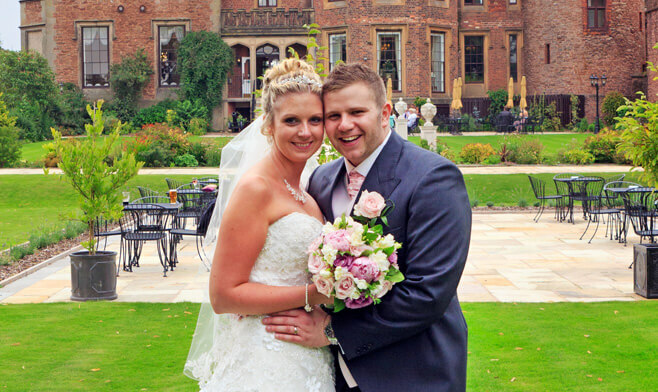 His knowledge of our venue and his DJ experience were evident and we were in no doubt that we were in safe hands. He even played us the version of our first song which was a great touch. Brian played a massive part in making our evening celebrations just as special as the day and even handled our parent’s requests so they could show off their jiving skills! Brian is definitely the DJ to get your party started! Thanks you from the bottom of hearts. We booked Brian for our wedding and we were not dissapointed. He was so fantastic and totally put us at ease from the first meeting. All our questions and queries were answered straight away and he was always available when we needed him. We were put in total control of our playlist for the evening and the whole booking process was very laid back. No added stress or worry which was great! Dont be afraid about Brian not having certain tracks or requests not being taken during the evening, he has every single genre. He really was fab from start to finish! Thank you for being so perfect and making our wedding reception extra special. Brian did an excellent job as DJ at our wedding. 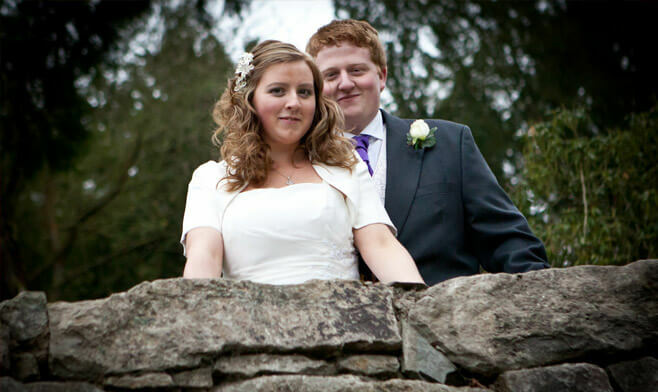 We were really impressed with his personal and approachable nature which confirmed we had made the right choice. He took all the songs we had suggested and took control of the evening when needed. No weird 80s haircut, no giant gold medallions, no horrendous microphone use, just a good honest music lover and a great DJ! Thanks for DJing our wedding. We would not hesitate in recommending Brian. 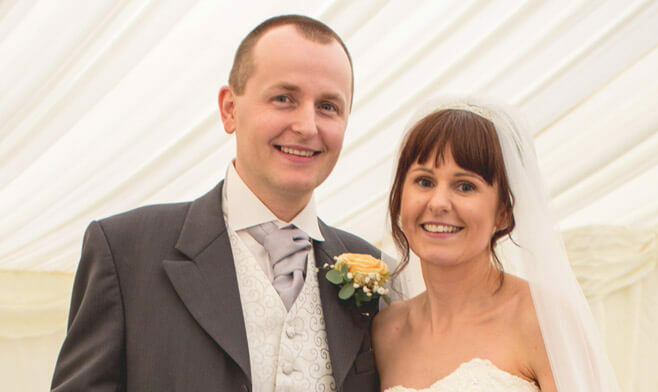 From the first time we contacted him right through to our wedding day, he was very responsive to emails, professional and always happy to answer any queries. 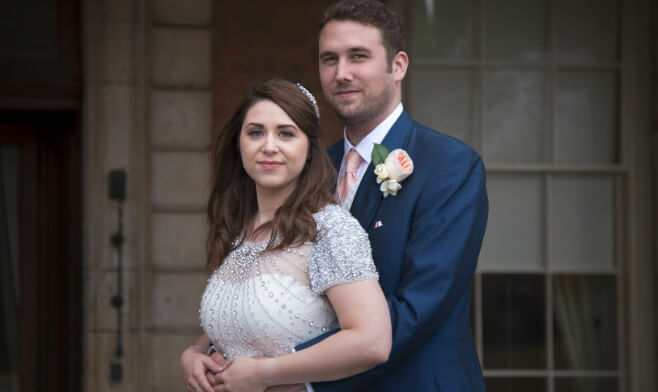 We met Brian for a drink a few weeks prior to our wedding and he made us feel really relaxed and confident that we had made the right choice. Brian listened to what we wanted music-wise and definitely delivered on the day. All of our guests had a great time and so did we! 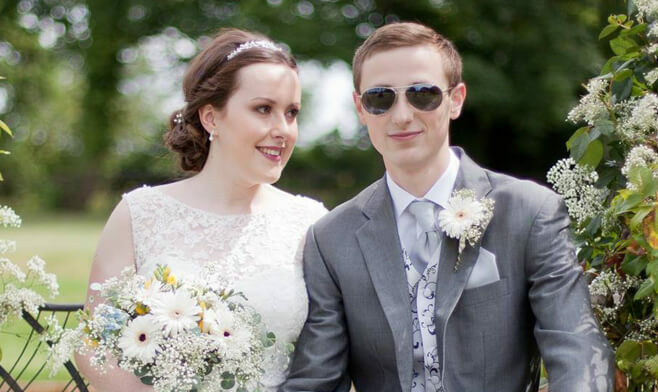 I wanted to say a massive thank you for being our DJ at the wedding, you were absolutely fantastic! I probably spent a bit too much time on the dance floor but I was having so much fun I couldn’t tear myself away! 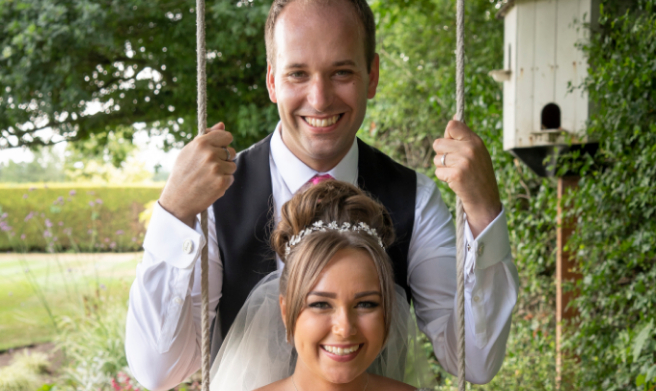 Your professional service, from our first meeting in Bridgnorth, to playing our first dance song over the phone, to the evening’s entertainment was absolutely first class, and I cannot thank you enough! Everybody enjoyed themselves, and the fact you had Mike dancing by the end, (and my 94 year old granddad) was a sight I never thought I’d see!I have already recommend you to friends getting married next year and I will continue to do so. Mike and I had the best day we have ever had, thank you for the crucial part you played! We can’t praise Brian enough for our evening wedding reception! Amazing from start to finish and everyone had a fantastic time. Really knows how to get people up on their feet! 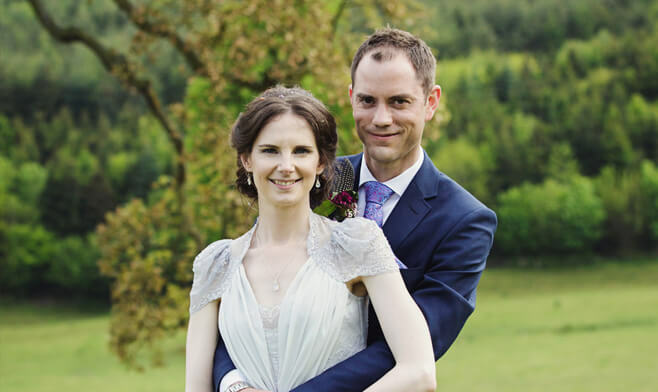 Thank you SO much for being such a wonderful DJ at our wedding at Old Downton Lodge. You really made our evening with an awesome flow of tunes which had everybody dancing. You were fantastic. So many of our guests made a point of saying what a great job you did - and I can only agree ;-) From the first point of contact through ‘til helping us work out the logistics of setting up etc at the relative last minute (our fault) - you were professional throughout which meant that I didn’t have to worry about a thing. A massive thank you for everything. 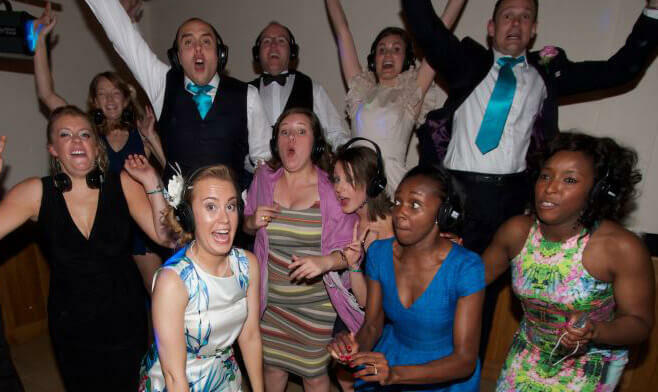 Choosing a DJ for some might seem one of the smaller tasks when planning a wedding. We on the other hand thought quite opposite, as the key to a good party is good music and the right atmosphere. After speaking to Brian for the first time I was confident he was the man for the job, and when we met him I knew he was!! A nice easy going guy who knew his stuff, not at all like the dated cliché. Brian was really keen to incorporate our playlist from the go and importantly he was honest enough to tell us if he thought that a certain song would empty the dance floor. To say the night was a great success is an understatement, we had lots of comments from our guests about the how good the party was. There wasn’t one time in the whole evening that the dance floor was empty!! and I think a large part of that was Brian knowing what to play and when to play it. Brian was recommended to us by a friend and what a great recommendation that was. Professional, approachable and friendly. 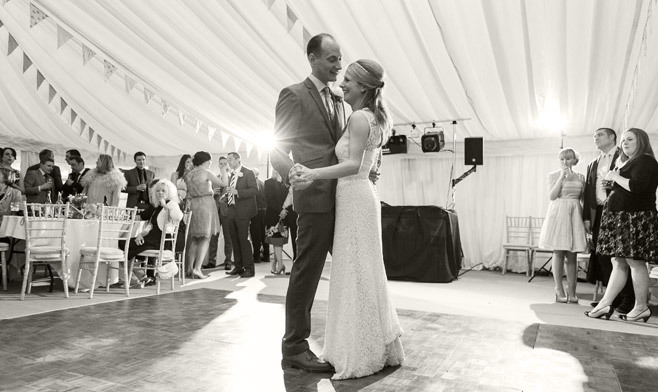 He has a clear talent and passion for music which makes him not your typical ‘cheesy wedding DJ’. Brian ensured all ages, musical tastes and even children’s requests were catered for. Couldn’t recommend him highly enough. Thank you for making our evening so special. Brian was recommended to us by the owners of the reception venue. From the moment we contacted Brian, his communications were timely and efficient. He made a great effort to get an understanding of us as a couple and our general tastes, we also appreciate the effort he put into trying to understand the rest of the audience that would be in attendance and balance the selection accordingly. On the wedding day itself Brian was ahead of time and unobtrusively got himself setup so much so that we turned around and the music started with a seamless transition between the acoustic set just before him. I cannot recommend him any more highly. 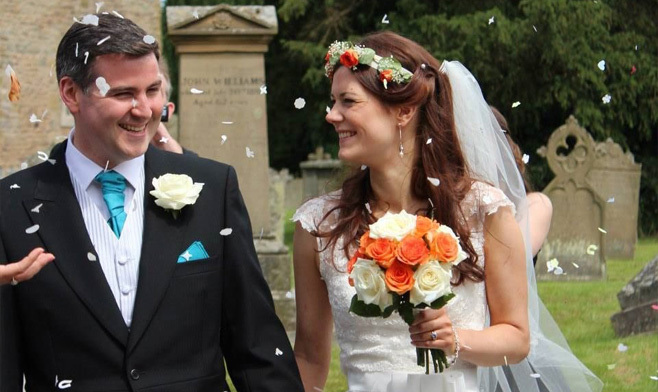 We can wholeheartedly recommend Brian (MisterFox) as a wedding DJ. From our excellent first meeting through to the event itself, his service was excellent and professional. He was entertaining of requests on the night, and knew how to keep everyone on the dance floor the whole evening. There were no issues with his set up or integration with other systems (ceilidh band) on the day either. Many thanks Brian for an excellent evening! We couldn’t recommend Brian highly enough. Not only is he a friendly and reliable person, but you can tell he loves his work and it showed as he had everyone dancing! 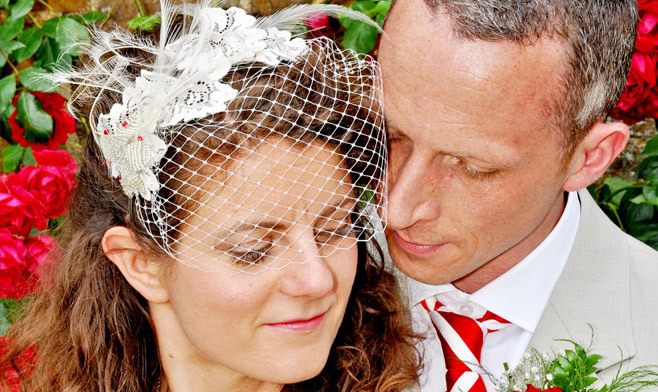 From start to finish Brian was very communicative and proved to be totally dependable. 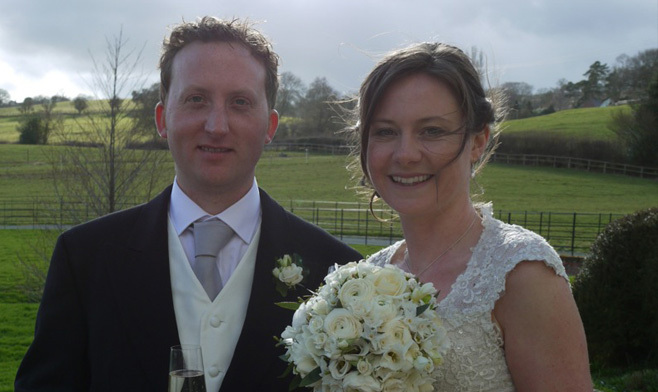 THe took our short wedding playlist to work from and delivered a truly brilliant evening. All our guests had a great time and the dance floor was packed from the go. 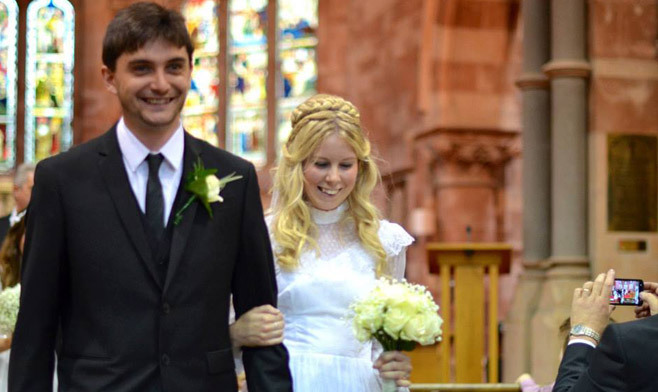 We are very grateful and strongly recommend his services for anyone looking for a wedding DJ. 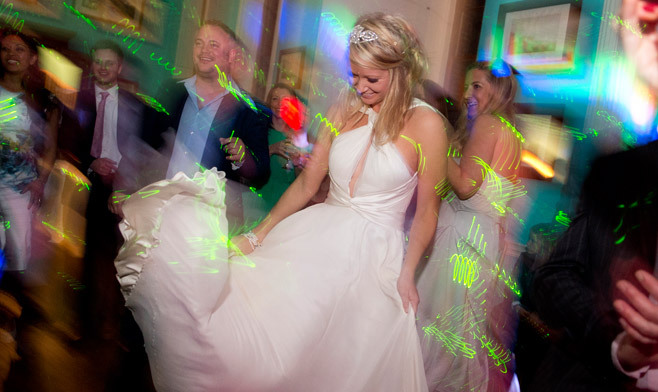 Brian is a fantastic DJ who never swayed from his promise to keep the dance floor full. We can’t thank him enough for making the evening so enjoyable. He captured everyone’s taste to keep all of our guests dancing and smiling. Even before the wedding, Brian proved to be an excellent choice! He was always prompt to reply to emails and he met with us to ensure he understood the type of evening we wanted. He went out of his way to speak with our band beforehand to ensure the evening would run smoothly; just another example of his professionalism and high standards. Brian was a fantastic DJ , a nice person to deal with and really helpful with playlist suggestions. We met for an informal chat and it’s clear he knows his stuff, even playing our first dance song down the phone to ensure the correct version. He also produced a surprise dance mashup mix which went down a storm!! He was early on the day and raring to go, we didn’t even notice him setting up. We’d like to thank-you so much for everything on the night, all of our guests had a good time and we couldnt have wished for anything better. 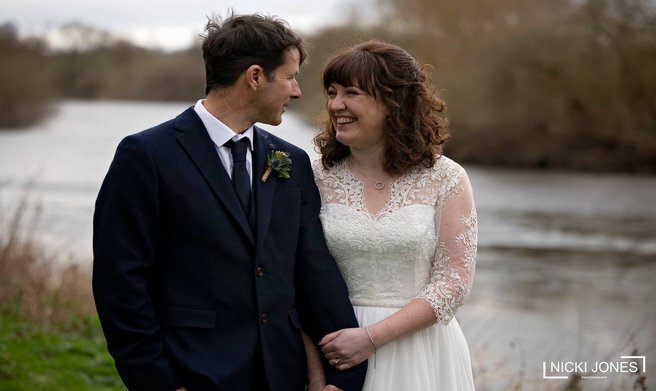 We booked Brian for our wedding in Oswestry in May and we were really impressed from the moment that we first met him through to the wedding itself. We had a relaxed chat with him before we decided to book and he made us both feel very confident that he would do a great job and play great music and we were not disappointed. 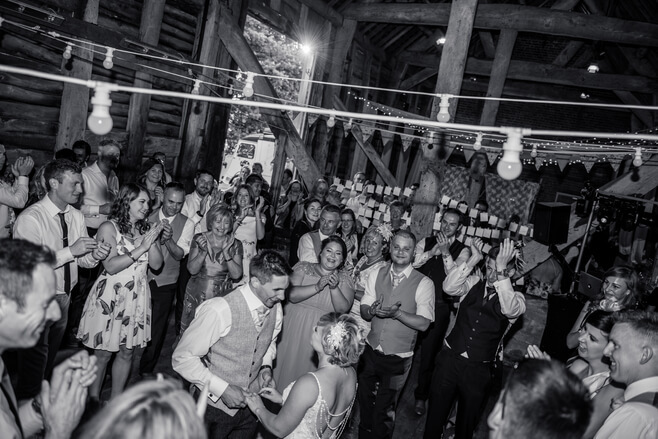 He double checked that the song we had picked for the first dance was the correct version (even playing it down the phone just to make sure), arrived early on the day, he was completely professional, very friendly and everybody had a fantastic night. I cannot recommend him enough. Brian was amazing right from the initial meeting and put us at ease straight away. We all had a top night, he managed to fit in an eclectic mix of golden oldies through to recent hits to meet everyone’s tastes and knew exactly how to work the crowd. We had so many comments from our guests on how brilliant the music was, the floor was full from the minute he started until the small hours! It is obvious he loves his job. We can not recommend him enough! 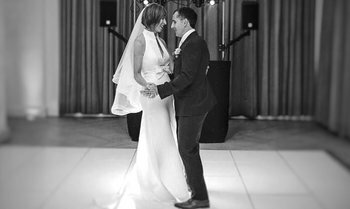 Thank you Brian for DJ-ing at our wedding in Shrewsbury, everyone commented on what a great DJ you were and the full dance floor was testament to that! 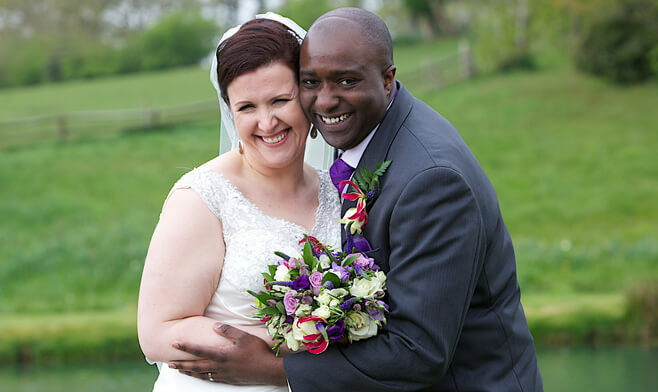 You made us feel completely at ease with your personable and friendly approach and gave us some really good advice for our first dance. Thanks again, we would recommend you in a heartbeat. 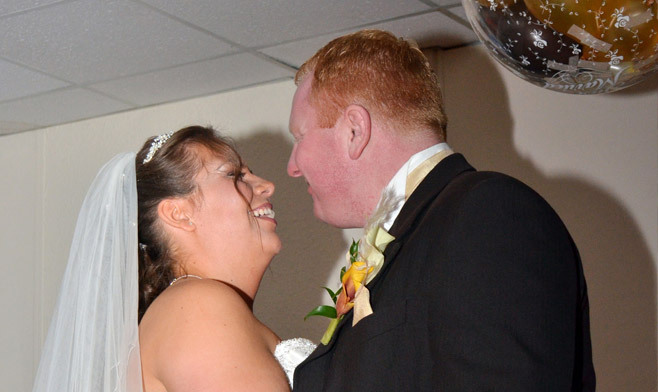 Brian was the first and only DJ we contacted for our wedding at Iscoyd Park as it was clear from the start he was the right guy! He was friendly and relaxed and obviously cared about the music he was playing. 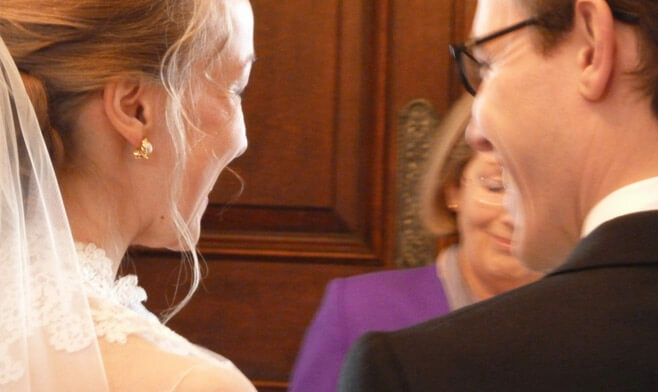 We had the chance to meet with him before our big day and run through specific details, as well as a call the week before where he played our first dance song just to check it was the right one! On the night Brian didn’t disappoint and definitely lived up to our expectations. We had a great mix of music played which got us and our guests dancing. We would recommend Misterfox to anyone looking for an excellent DJ. Misterfox was our wedding DJ at Walcot Hall. We were reassured from the start, as he was relaxed but professional, taking time to establish exactly what music we liked and what we wanted. On the night he played a good mixture of guests' requests, our own favourites and his carefully selected floor-fillers, and was very flexible in terms of fitting in around the band, cake cutting etc. All-in-all, it was a fantastic night. I contacted a few DJs to potentially do the music at our wedding, but after having spoken to Brian on the phone it was an easy decision to make. He was so friendly and enthusiastic, and made it clear that it was completely up to us the style and choice of music, but he was also happy to make suggestions too. This is a man who clearly loves his job. He was always happy to answer any questions I had, and even phoned me up and played the first dance down the phone, just to check he had the correct version. He also reassured me that we had made the correct choice, as we had been torn between 2 different songs. On the day he arrived in plenty of time to set up, and kept the dance floor full throughout the evening, playing music to suit all tastes. We had the youngsters dancing to old classics from well before their time, and the oldies 'waltzing' to the likes of the Killers and Muse! Everyone said they had such a great time. Thanks so much for helping make the perfect day! 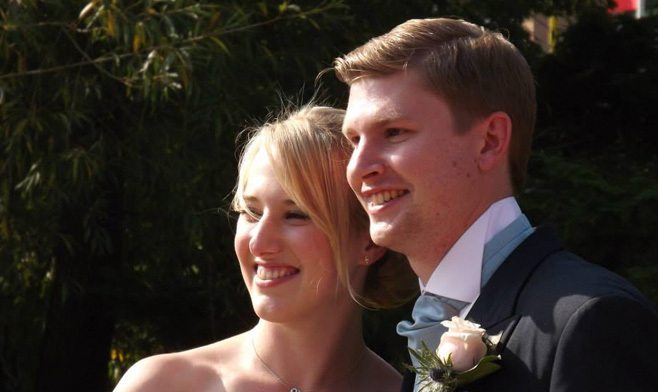 We were recommended MisterFox by Jonathan's Cousin who had him previously for his wedding. MisterFox was absolutely fantastic and kept in contact from the day we booked him. He met with us to discuss playlists and first dance versions. He guaranteed us a full dance floor - and he kept his word as it was never EMPTY! 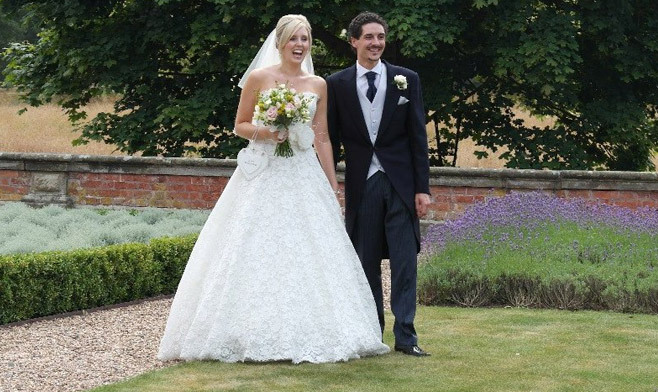 We would like to Thank Brian for all his hard work and to adding to our very special day! We will recommend you to everyone. Mister Fox did an absolutely fantastic job DJing our wedding. 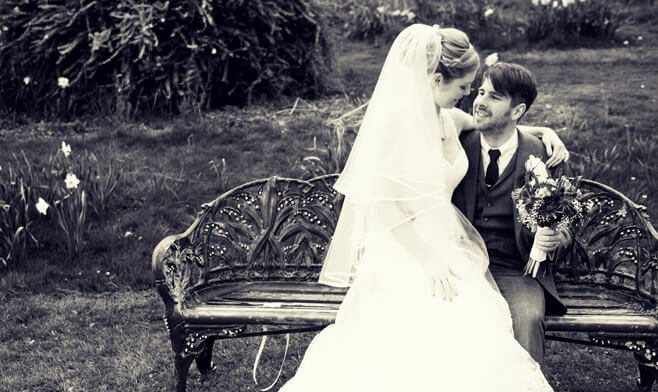 From the first conversation over the phone it was clear that he would provide the professional and tailored service that we wanted - even down to phoning us and playing our first dance song in full the week before to make sure we were happy. On the day he arrived and set up in plenty of time with no hassle and proceeded to keep the dance floor packed all night with the type of music that we love. We've had loads of compliments on the music from our friends and the silent disco will be talked about for years. Thanks again - we couldn't have asked for more. 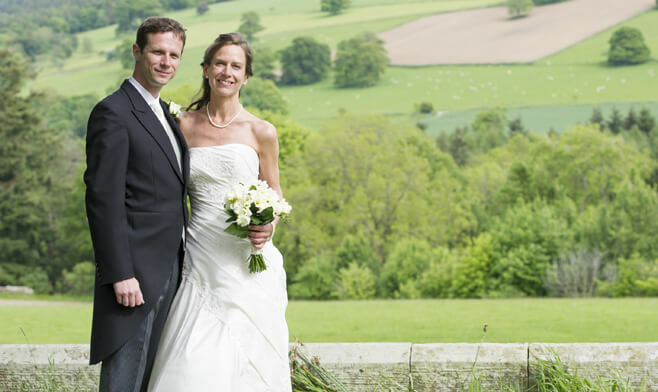 MisterFox delivered a very professional tailored service for our wedding at Walcot Hall in Shropshire this year. He had a broad variety of music for all tastes (as well as some eclectic tunes) to hand and judged the crowd very well on the night. MisterFox required no direction or assistance on the day, we arranged everything before the wedding day. He arrived early and left late which is what you want from a DJ. I would recommend his services for your next function. We asked mister fox to dj at our wedding at Walcot Hall this March. He was excellent, played what we wanted and took lots of requests from guests, which really got everyone up and dancing! 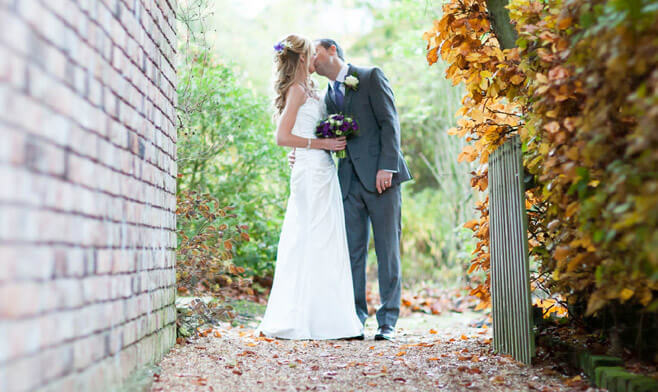 MisterFox was the perfect DJ for our wedding at Iscoyd Park. He offered a personalised service, catering for our music tastes and those of our guests which was no mean feat! We highly recommend Mister Fox for anyone requiring a wedding DJ. 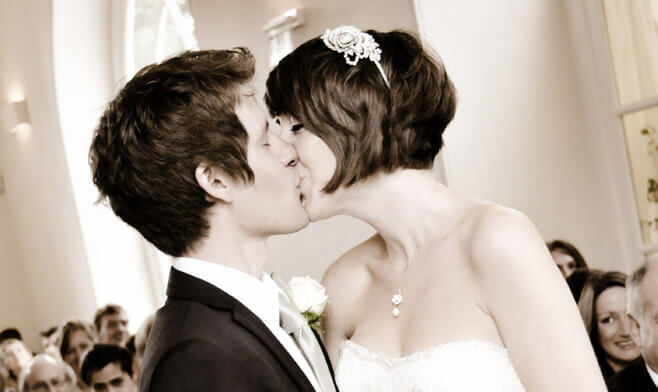 Really wanted to say a big thank you for your hard work and skills at our wedding. You really braught the night to life. My family have all been commenting on your choice of music, especially the last song which left everybody sweating and smiling. We wouldnt think twice about recomending you. The fact it's taken a year for me to write this shows how good he was otherwise I'm sure you would agree I wouldn't bother. Professional, conscientious, caring, nice guy and very good at his job. He leaves you in know doubt about the top job he is going to do. Misterfox met up with us on a couple of occasions to discuss things, welcomed us to his house, and he even invited us to listen to him play at The Swan in Ironbridge before booking him. The guy is class, book him! Our dance floor was full from start to finish, and I've never seen that before.